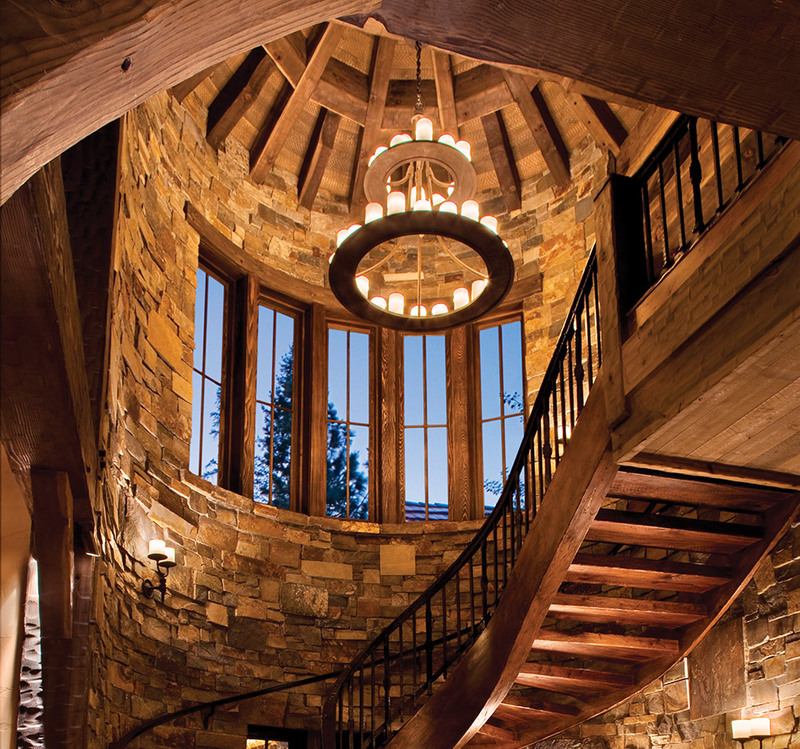 Stone is significant to mountain homes whether inside, part of the surrounding landscape, or as the home’s base. Montana Rockworks provides stone varieties to harmonize with locations and balance the nuances of design, as well as the skilled craftsmanship for exacting cuts to maximize the stone’s beauty and functionality. 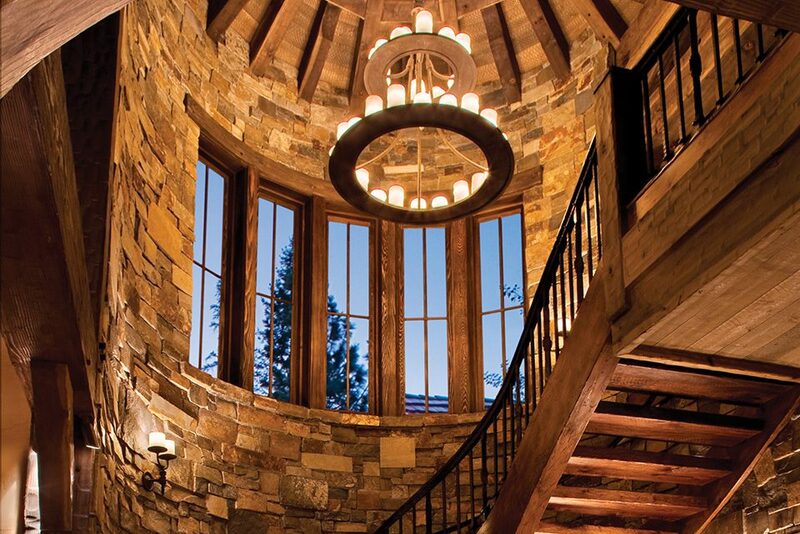 Stone is the most natural building material, and as design professionals recognize, it connects a home to the land and the greater environment. Because stone is formed by a unique changing geological history, each piece of stone is different and each tells a story. It is the nature of stone to reflect strength, stability, presence, texture, and subtle variety. Three different professionals discuss the importance of using the right stone for their creative efforts: a local fine homebuilder, an experienced interior designer, and a landscape architect with a passion for nature. Their expectations for stone and the functions stone serves may vary, but the commonality they share is recognizing how important it is to partner with a rockworks professional who can provide the stone they envision with the precise cuts to implement the design. In each case, they have found this in their partnership with Montana Rockworks. When building a home, it makes sense to choose materials that provide physical and aesthetic durability. That is, products that ground and stabilize a structure for years while also providing enduring aesthetic appeal through the flex and flow of building trends. For David Lloyd of Lloyd Construction, who grew up in the construction industry, stone goes the distance. “Stone exudes stability,” says Lloyd. And, as a natural product that resists wear from the elements, use of rock requires less maintenance, allowing homeowners more time to relax and enjoy the mountain lifestyle. “You don’t hear people talking about having to repaint their stone every five years like they do a lot of other materials,” Lloyd says. He finds stone especially well suited as an exterior surface for columns and in places where rain, sun, or sprinklers will repeatedly wear the surface. In addition to the low maintenance required and its sturdy corporeality, as a native material of the mountain landscape, stone projects an environmental essence that lends homes an enduring sense of solidity and natural appeal. “As a design element, stone accentuates the natural beauty of homes in our local mountain market, whether contemporary or traditional,” Lloyd says. As design trends have moved toward the mountain-modern aesthetic, defined by crisp and exacting clean lines, Lloyd has found that another benefit of using stone is the variety available within the material, offering up welcome options to suit design. To source stone that meets his needs, he depends on a supplier to offer several options in various colors and sizes, as well as to provide offsite prep of the stone and flexibility to cut the stone for a variety of uses. Montana Rockworks is the go-to source for Lloyd’s needs; the company excels at meeting the requirements of variety and for exacting lines that require compound miters for their pyramid-like installation, which is a feature unique among suppliers. Color. Luxury. Comfort. Texture. Presence. These are just some of the words that Susan Whitman, ASID and Peggy Richards use when asked to describe why they choose stone over other products as elements of interior design. As owner and project manager of Susan Whitman Interior Designs (SWID), Whitman and Richards go on to play off each other in a flowing dialogue as they describe the balance they seek in their stone designs. 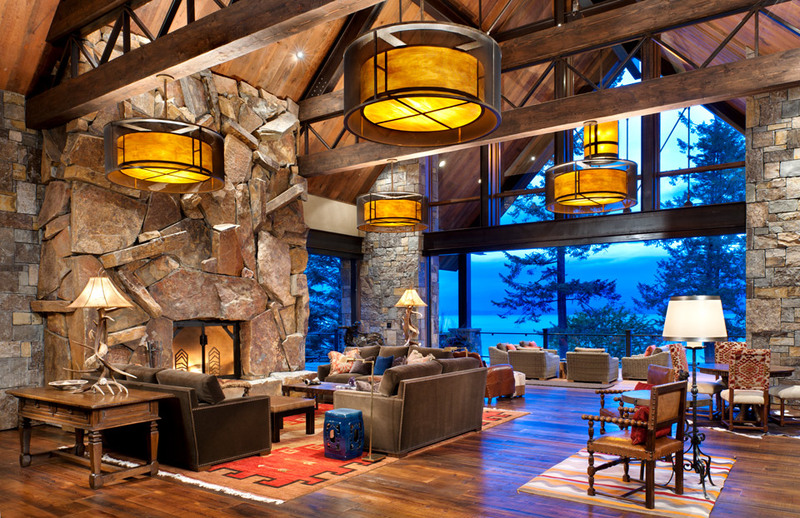 “We like to use stone on fireplace surrounds or pillars or anything where we can blend a home’s exterior with the interior to create a sense of harmony,” says Whitman, after Richards explains how the use of stone outside and inside syncs a home with the mountain environment. The pair prefers natural stone over synthetic materials because it’s sturdier than most veneers and offers an appealing natural aesthetic in addition to load-bearing ability, which comes into play with remodels, specifically. Working in interior design since 1995, the team at SWID has seen a host of trends come and go and are excited to see that the use of natural stone is here to stay. “There’s so much more available right now than there ever was,” says Richards. “Before people just used cultured stones and it was horrible, but now it’s real stone, which has such a natural stone look.” Given the many options for use of the material in their designs, Richards and Whitman note that the availability of a wide variety of stone is key, as is a strong relationship, when seeking a source for stone. The two are emphatic about the binding essence of stone—the material’s ability to connect and balance two completely different rooms, as well as the exterior and interior. “When we use stone for flooring material, for example,” expands Whitman, “you can extend your line of sight [from the flooring] to continue to the exterior, so it appears as though the outside becomes the inside in a way.” Whether speaking about their design work, their partnership, or their relationship with suppliers, the theme for Whitman and Richards is connectivity. A native of New England, Ben Young hails from an environment defined by stonework: stone buildings, rock walls, and other enduring stone structures provide a common, binding thread throughout the towns and rolling hills of the region. Young finds that the use of stone in our high-mountain residential landscape can tie our spaces to the greater mountain environment in a similar way. “No matter what you do, you’re reckoning with stone in a lot of these mountain towns,” says Young, founder of Ben Young Landscape Architects, as he cites the Boulder Mountains as an example of hallmark stone vistas in our local landscape. Young spends as much time as he can in nature, gleaning inspiration for landscape designs that connect homes with the surrounding mountains. Given the wide variety of settings and design considerations, Young says a strong, well-communicated relationship with his supplier is key to sourcing just the right stone for each project. Working with suppliers from all over the country, Young searches for good variety and inventory as well as for reliability, and a sound design sense. When he was searching for stone to be donated to the Wood River YMCA, for example, he knew that Bill Carter of Montana Rockworks would be able to deliver, sight unseen. “When you’re dealing with a truckload of stone, especially giant stone, you get into consequential things pretty quickly,” he says. “It’s important to work with someone who has a good design eye and works on the same wavelength as you.” A tour of the recently completed “Bonni’s Garden” at the YMCA offers up a view of the beautiful result of this productive relationship, as children play on stone slabs chosen to connect them to the surrounding mountains. Given the beauty and availability of natural stone today, Young says the greatest challenge can be using too much of a good thing. “Stone can have power,” he says. “But if you use too much it can become trivial.” And so, as with the space between our homes and the mountains, between work and adventure, the ideal use of stone provides balance and beauty. Previous post SO, WHAT'S NEW IN ELECTRONICS?